“Poppy and Baz had been playing New Orleans rhythms for an hour, but now there was silence in the little cottage. They sat gazing into the fire, sitting side by side together on the large, old sofa – threadbare, but beautifully soft and deep. Baz propped his bass against the table, there Poppy had lid her clarinet. Its 1924 and the Derrington twins are hoping for their season. After an eventful last year when their mothers sister arrived and brought with her shocking news and good fortune the twins are hoping for more of the same. Now their older sister is married to a junior lawyer and their aunt is on her way back to present them surely that good fortune must be here? But no, their fathers estate is in a more desperate state than ever and the heir to it all is putting pressure on him to hand it over. The Derrington’s have no money at all and that leaves Poppy and Daisy to find and marry money. However neither are interested in money, preferring Jazz and Film making to the ridiculous notions of the past and inheritance. When it comes to choice will the girls follow their hearts or their family duty? 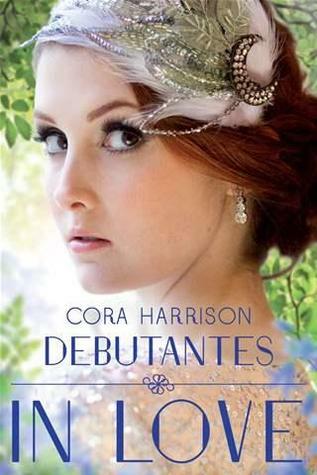 I will always have a soft spot for any fiction set in the 1920’s and I absolutely loved the first book in this series, thankfully Debutantes: In Love did not disappoint either and carried on the story brilliantly from where Debutantes left it last year. The story mainly focuses on the girls and their season, with bits here and there about the state of Beach Grove Manor and their father’s plight. However what really hooked me in was all the social elements; the up and coming Bright Young Things and the way things were changing when it came to laws and women’s freedom to work. Both the girls had dreams they wished to follow and I was rooting for them all the way through. Of course there was still a lot to come for women’s rights after the 20’s (and still is if you ask me!) and there were a lot of things about the setting which bugged me, but I loved that it was the real start of change. The writing is brilliant and the way Cora Harrison describes the styles of the time and the dialogue used is just perfect, I could see and hear the characters perfectly and I loved that the language reflected the time of change in the story for all involved. I loved that music was such a big thing in the book and that there were points where the text flowed like poetry, especially when Rose was talking. The Epilogue was possibly my favourite part of the book purely because of that. The story is a little twee when you get to grips with things and I worked something out way, way too soon but I still really enjoyed it. For those of you who may come to this book a while after reading the first don’t worry, there are hints and reminders of things that happened but they are written really well into the book so you will hardly notice. I would definitely recommend this book and best of all it will be a great read for a wide range of people including those romance, historical and issue-themed fiction lovers. I hope there is a third book concentrating on Rose and her story but I am worried that a part of the story that I was really invested in may possibly be missed because of some of the things that happen in this book… I’m sure we will see though and if Cora Harrison does produce another I’m fairly sure I’ll love it anyway! Debutantes: In Love was published my Macmillan Children’s Books on 1st August 2013. My copy was sent from the publisher in exchange for an honest review. I know I enjoyed Debutantes but I can’t actually remember much of what happened in it! I don’t know if I’ll be reading this but glad you enjoyed it, great review!